The 1 C-Bitrix system is considered to be one of the most popular not only on the Russian market, but also among foreign developers. It offers the convenience of site maintenance and flexibility of settings. The 1 C-Bitrix system is used by sites of diverse complexity: news agency sites, business card sites, social media sites, e-stores and etc. However, over time the pages are loaded more slowly. The core of the problem is Bitrix image optimization which is not performed by the CMSown means and has to be fulfilled by the third-party tools. In order to make pictures occupy less disk space and get loaded faster one should use a plugin to optimize images in Bitrix. The solution for that is OptiPic plugin. 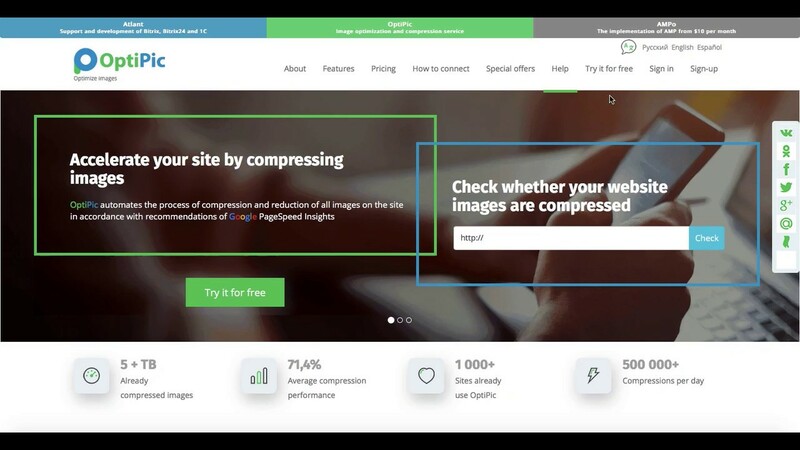 Website image optimization in Bitrix through OptiPic allows accelerating the website loading by 2-3 times. Practice has shown that the resources do load faster, which is confirmed by the users themselves. This is especially critical for online stores and catalogs, because the customers might not wait for the page to load and leave for the online competitors. OptiPic plugin for image compression in Bitrix is built on an algorithm that identifies the technical data in the image file and removes them. These data do not affect the quality and external view of the picture, but nevertheless affect its size. In some cases, technical data take up to 90% of the file size. That is the reason why OptiPic plugin is used for image compression in Bitrix. The average image reduction is 70%. Besides, plugin needs to be setup once and afterwards it keeps working both with the pictures that are already available on the site and with the newly uploaded ones. Website image compression in Bitrix runs in the background and does not require large computing power. Nothing changes for the website visitors apart from accelerated web page loading. Administrators will be able to see how the plug-in frees up space on the hard disk of the server by reducing the size of images. The optimization of pictures in Beatrix will no longer require manual administrator intervention. OptiPic plugin should be setup once and then all necessary operations will be performed automatically. How can optimizing images for Bitrix speed up a site? How to get started with OptiPic service for 1С-Битрикс for image compression? The module allows you to manually start compressing all images on the site (png and jpeg), or leave this process in background mode - then gradually all your pictures will be compressed automatically.